The main reason for one of the most hated Google redesigns, the famous iGoogle update from 2008, was to transform gadgets into social web applications. The visible changes didn't make the upgrade compelling, since most users only saw a sidebar that took away some space from an already crowded homepage. Some gadgets could be maximized in a canvas view to display even more information, but not many gadgets used this opportunity in a meaningful way. Google didn't offer an option to switch back to the classic iGoogle interface, but you can still find it if you go to http://www.google.com/ig?hl=all and in some local versions of iGoogle. The second step of the iGoogle update is to make it more social by converting iGoogle into an OpenSocial container. That means you'll be able to add to iGoogle applications that are already available in social networks like MySpace, Orkut, LinkedIn. The main problem is that iGoogle is not a social network and the "friendship" concept is vague in the GoogleLand. "Starting this week, we're rolling out some new social gadgets for iGoogle to all Australian users. Not only can you continue to do all the things you love to do on your homepage, but you now have the option to share all kinds of information, play games and collaborate with your friends too. (...) Your current gadgets will continue to work normally and you don't have to take advantage of the social gadgets if you decide it doesn't fit your interest. But by adding and enabling social gadgets, you'll be able to have an even deeper, interactive experience with your gadgets when you share them with friends." But who are these Google friends? The answer is pretty simple: the contacts from the built-in Friends group. "Friends is a group to help you organize your contacts. You can move contacts in and out of this group at any time, and this is the only group of people who can see your updates and with whom you can share social gadgets and social gadget activities. Similarly, you can see someone else's updates or social gadget activities only if they have included you in their Friends group." For Google, friendship is a one-way concept. You don't have to invite other people to become your friends: just add them to the built-in Friends group and they'll be able "to see what you share or do in social gadgets through the gadgets themselves, or through a new feed of information called Updates, a way to see what your friends are doing on iGoogle". An example of social-enabled gadget is "Social Photos", which shows the latest photos uploaded to Picasa Web and Flickr by your friends. Other examples include: the "Timeline" gadget, that lets you share what you are doing and see your friends' status messages on a timeline; puzzles and games like NY Times Crossword, chess, trivia; collaborative gadgets like ToDo List. The features will be rolled out this week at iGoogle Australia, but you can also try them in the iGoogle Developer Sandbox. 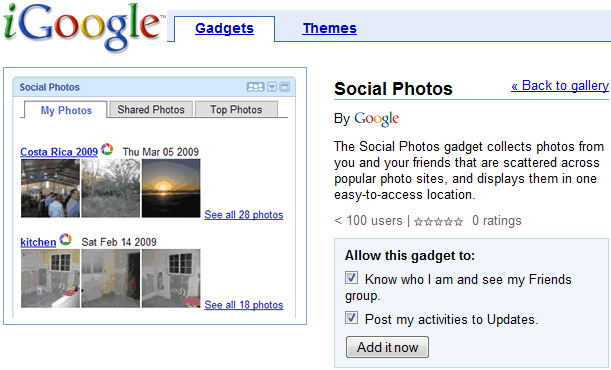 Developers can find more about iGoogle's social gadgets by visiting this page. You said it perfectly - Google is not a social network and their friendship concept - their entire social strategy for that matter - is vague. I love Google and use their products as much as possible on my site - but I've had to go with facebook's Connect as my social strategy because Google isn't even coming close to the features and viral effect that facebook Connect has - nor the social userbase at this point. I have Google's friend connect on the site too, but I'm struggling to figure out a specific strategy to use with it. The OpenSocial concept is great, but with facebook leading the way right now I don't know when or if Google and OpenSocial will ever catch up. I mean, when people sign up as members of your site or add you as a mutual friend, shouldn't there at least be a "send this person a messsage" link next to their photo in the gadgets they have already created???? I can build my own gadgets from scratch, but I shouldn't have to build the obvious ones from scratch too. I'm busy, ya know? Help a guy out a bit, Goog! With most Google projects, even in the early stages, the goal and the end-game is clearly evident. You can see exactly where they're going with it, and how they plan on accomplishing it. But it feels to me like their social strategy is a rowboat without paddles right now just floating along hoping for a lucky current to take them where they hope to be. Google Profiles if combined with the above would get closer to "social". And if they master this, then it could be curtains for sites like LinkedIn, which is barely more than a directory of people who've padded out their profiles with resume information. If this data was also completed on Google Profiles -- and it requests much of it already -- then why would anyone go to many of the other social networks? They'd come to ours for the sales leads, but LinkedIn doesn't really have such a "killer app". 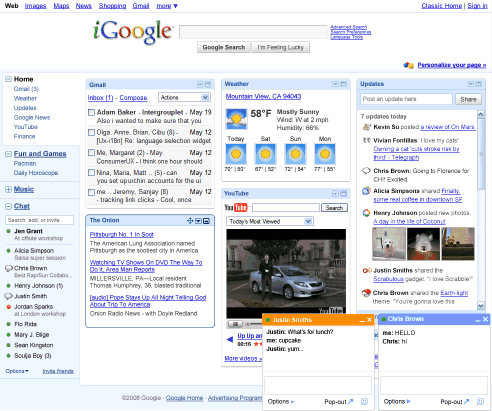 Sure, the new social features are a nice addition, but won't Google Wave render this obsolete? That was its intended purpose (sort of), after all. Well I am (or was) in the developer sandbox and still cannot access the timeline gadget from either the .com or .com.au address of iGoogle. Does this mean I have been unsubscribed from the sandbox, or can no one access this yet? Overall, I think this is a great idea. I love the idea of being able to play multiplayer games with friends, and with O3D, this could become a reality within the Google homepage. I think that Wave is more of a communications platform (at least this sandbox version is), so there is a different type of social interaction there, but perhaps this should all be integrated into one somehow (social.google.com?). Whether or not that is possible is a different question. I hope that somewhere within Google is a “Master Plan” regarding where all this will end up. My fear though is that there isn't, nor is anyone at Google particularly thinking about such a plan. Facebook's success surely scares the heck out of Google, but making all of Google look like Facebook can't possibly be the right answer. There are too many people who go out of their way to avoid sharing too much information about themselves and those people must surely think that some day soon everything they have ever done using Google will become public, either by accident or by careless design. What Google SHOULD do to address these concepts is to compartmentalize their social networking into a separate product that people could either use, or ignore. They already HAD a perfect vehicle to do this in Orkut. But they should have let it wither on the vine (actually that is what they have done) and developed a new product with a better name, and a more Google-like infrastructure. You would sign up for that service just like you do YouTube, with a NEW userid which isn't necessarily connected to your Gmail and other Google ids. From that separate identity you could then share or not share whatever other aspects of your online existence you chose and none of this sharing would even reveal your Gmail address (unless you specifically gave it out). That's a simple design that I think most people could comprehend without shooting themselves in the foot. If Google continues to rely on “organic” growth of their product mix I think they could end up in a heap of trouble. I hope SOMEBODY there is looking at overarching design. Well iGoogle is no more...has anyone had any luck with their Google+ Profiles? I have seen a little traction, but not a ton. Curious to see what you all have been able to do.